We’d love your help. Let us know what’s wrong with this preview of The Last Speakers by K. David Harrison. To ask other readers questions about The Last Speakers, please sign up. What do you call someone who speaks 2 languages? What do you call someone who speaks only 1 language? As English, Spanish and Russian seep into every last corner of the globe, "Last Speakers" is an excellent argument that languages encode different ways of thinking about and viewing the world, and that the loss these languages in the face of more dominant languages will result in the a loss of those unique perspectives. The What do you call someone who speaks 3 languages? I did enjoy this book--actually, it's fascinating. It is also all over the place. I was expecting some straight-up nonfiction (languages that are dying out, what is unique to each, etc etc). This book is more of a memoir: Harrison's experiences with last speakers, the difficulties of traveling to them, logistics, why they are the last speakers, etc etc. I love me a memoir, but it was so not what I was expecting. I would rather read about the languages than about the problems of traveling with cam I did enjoy this book--actually, it's fascinating. It is also all over the place. I was expecting some straight-up nonfiction (languages that are dying out, what is unique to each, etc etc). This book is more of a memoir: Harrison's experiences with last speakers, the difficulties of traveling to them, logistics, why they are the last speakers, etc etc. I love me a memoir, but it was so not what I was expecting. I would rather read about the languages than about the problems of traveling with cameras when it is 0°F out. Rather than organize the book by continent, or language, or chronologically, or in any other of myriad ways this book could be organized, it is lumped into odd chapters. The first two are about his choice of profession and first field experience (Siberia, grad school). But then we have "The Power of Words," "Where the Hotspots Are," "Finding Hidden Languages," "Six Degrees of Language," and yes, four more chapters. Not all of these chapters divisions are clear. In one chapter you are in Paraguay! India! Siberia! Or Australia! Michigan! Siberia! As soon as he gets going on a good story or example, he bounces on to the next. It's like watching children's TV. Egads. No information that was of any particular interest or use to someone with even a modest linguistics background like myself, just vague descriptions that didn't even make all that much sense without examples. And the author could not get over himself. He actually devoted half a chapter to discussing a meme he started and how many facebook friends he has. That was his most egregious act of self-promotion, but the rest of the book was sprinkled well enough to taint. 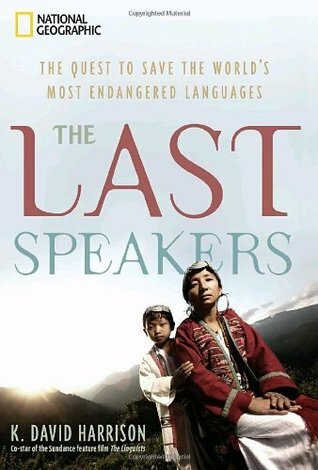 I saw The Last Speakers: The Quest to Save the World's Most Endangered Languages by K. David Harrison while visiting a public library during a visit last month to Los Angeles. I noted the title and requested it via interloan when I got home. The fabulous dedicated staff of my library system's Interloans Department found the book--and I had it in my hands--within four days of my original request. Talk about speedy service. My armchair education experience involves studying endangered languages, sp I saw The Last Speakers: The Quest to Save the World's Most Endangered Languages by K. David Harrison while visiting a public library during a visit last month to Los Angeles. I noted the title and requested it via interloan when I got home. The fabulous dedicated staff of my library system's Interloans Department found the book--and I had it in my hands--within four days of my original request. Talk about speedy service. My armchair education experience involves studying endangered languages, specifically European. Aside from reading about many of these languages, I have spent several years studying two of them in the places where they are still spoken as an everyday language: the Sursilvan idiom of Romansch in southeast Switzerland and Breton in Brittany. My eye was drawn to The Last Speakers and although its focus was on languages from central Asia and Siberia, South America, and the indigenous languages of North America over those in Europe, it was still a must-read. Language extinction--and its more dramatic synonym, language death--can get me more worked up and emotional than learning about the extinction of an animal species. With a team of linguistic and audio specialists, as well as the all-important local guides, Harrison embarked on journeys to document the most endangered languages on the planet. He travelled to all the places where these severely endangered languages were still spoken. His treks to some western Mongolian and Siberian towns could fill books of their own. "Listening to the elders, I am astonished by how little we know and how vast human knowledge is. We find ancient systems of knowledge--in many cases more sophisticated than what modern science knows--about the natural world, plants, fish, weather patterns, sea ice, and landscapes. We find amusing stories of reindeer, bears and fishes, weather patterns and stars, healing plants, mythical yeti-like beasts, and world-creating ducks. In short, we find a mental catalog of mankind's attempts to make sense of the world and harness its resources for human survival. The elders' stories often contain a history of the first contact between an indigenous people and colonial Europeans, an encounter that has driven most of the world's languages to the very brink of existence." "Efforts to listen to and record small languages and their story traditions deserve our urgent attention. This must be accomplished while the elderly storytellers are still talking. If tales fall into disuse without being documented, we won't even know what we are losing." "I have been dismayed to find indifference in the very communities where languages are most threatened, but also heartened to see individuals undertaking heroic efforts to sustain heritage languages. An elderly Aboriginal lady, Thelma Sadler, teaches youngsters in western Australia the names for local plants in her Yawuru language. Young men in a mountain village in India perform hip-hop in Aka, a language spoken by barely a thousand people. These language warriors reject the false choice of globalization that says people have to give up small languages and speak only big ones. Their resistance gives hope for language revitalization efforts worldwide." "'Sometimes I cry,' he says. 'It's not just the language that's dying, it's the Chemehuevi people themselves.' Johnny has made efforts to pass the language on to his own children and others in the tribe. 'Trouble is,' he explains, 'they say they want to learn it, but when it comes time to do the work, nobody comes around.'" "I make no judgments about what works; all I am sure of is that a language cannot be 'saved' by outsiders. Scientists and other outsiders can assist or enable, but the decision to keep a language alive, and most of the hard work required to implement that decision, must be undertaken by the communities that own and cherish the languages." This fascinating book, sponsored by the National Geographic Society, describes the plight of a number of threatened languages in various corners of the world, as well as efforts to save them. The book’s author, David Harrison, is a young linguist whose focus is on documenting, recording and studying (and possibly saving) endangered languages. He does this by traveling to the furthest reaches of Mongolia, Siberia, Papua New Guinea or Paraguay, tracking down the (often octogenarian) last surviving This fascinating book, sponsored by the National Geographic Society, describes the plight of a number of threatened languages in various corners of the world, as well as efforts to save them. The book’s author, David Harrison, is a young linguist whose focus is on documenting, recording and studying (and possibly saving) endangered languages. He does this by traveling to the furthest reaches of Mongolia, Siberia, Papua New Guinea or Paraguay, tracking down the (often octogenarian) last surviving speakers of a local language, and interviewing them at length. With the help of recordings and videotapes, his team creates a record of languages that may be just a few dozen speakers away from being silenced forever. In the best National Geographic tradition, the book is part travelogue, part anthropology, and part missionary zeal. The travel parts were fun to read for armchair travelers. Flying to Mongolia in a decrepit Soviet-area plane, or navigating down a dangerous river in the rain forest of South America, living with nomads in their yurts… all good stuff. The anthropology parts, about shamans and rituals, were also fascinating. The “zeal” part, where the author makes an impassioned plea to save endangered languages, was a bit overpowering. I don’t disagree with his argument that the local languages of so-called primitive spots on the globe contain a wealth of information about the natural world that we could put to good use in these times of pollution, deforestation and global warming. I totally agree with the statement that being bilingual may be as good for your brain as doing Sudoku puzzles. But the same arguments and statements, and the parallel between endangered species and languages, were trotted out quite repetitively in the course of the book. The author does seem rather full of himself, and is very liberal with references to "my team" and "my idea" and "the term I coined". Being a bit of a language geek, I liked the parts about language itself best. The author had chosen his examples with care. I found it fascinating to read about the many ways in which new words or concepts can be expressed. For instance, in some villages close to a river, the usual way of saying where you are going is not by saying “ I am going to x”, but by saying “I am upstreaming to X”. And if you find yourself on a different part of the bank, you would say “I am downstreaming to X”. Another language has several words that we would just translate by the word “to stand”, depending on who is standing. Another language has several words to describe reindeers or yurts of various ages, reproductive status, fur color and other parameters. The descriptions of field work in the linguistics field made for great reading. The author seems to have been involved in in-depth, multi-week visits to specific regions, as well as in some shorter visits to various language hotspots around the globe. I think that the scientific value of these fly-in and fly-out visits is probably limited… but they seem to have been conceptualized more as a dramatic way of drawing attention to the risk of losing endangered languages, than as an encyclopedic exercise. Still, I found it fun to read about how the team would try to track down the last speakers of a specific language and try to coax them into speaking. For the author, it’s not just about the language, but also about the content of the knowledge that is passed on in that language. Whether it is a story about navigating the inhospitable tundra, or about a girl being sold as a bride, or about aboriginal creation myths, this is not the stuff you find in most books about language! I also found it interesting to read how some languages survive and others don’t. The recurring refrain is that the younger generation has typically been taught to speak in English, Russian, English or some other language, and that they have been made to feel that there is some shame associated with speaking a “primitive” language. Older people tell of having been punished in school for speaking their own language. And yet, there is also a special language for (male) shamans in one tribe, a language that is not learned at birth, but acquired in adolescence, when a young male is selected for training as a shaman. Or there is a language that flourishes in the middle of Mexico City, hidden in plain sight in a bustling Spanish-speaking metropolis. Or a language that is spoken by some members of the family but not others, a language that is so secret that often the speakers in one isolated village don’t know who in the next village might speak the same language. In summary, although the message that endangered languages are in need of, and deserving of, being saved, is rammed home a couple of times too often, this is an engrossing book, a real treat for anyone interested in language, communication, or even plain old armchair traveling. My feelings about this book are somewhat complicated, but not because of anything that is in the book itself. The book itself is an excellent one, but the context that book is in is a troubling one. For one, this book is a somewhat obvious cash grab on the part of National Geographic to take advantage of the unexpected popular success and critical acclaim of the documentary film The Linguists, which explored the author and some of the speakers of nearly extinct languages he sees around the world My feelings about this book are somewhat complicated, but not because of anything that is in the book itself. The book itself is an excellent one, but the context that book is in is a troubling one. For one, this book is a somewhat obvious cash grab on the part of National Geographic to take advantage of the unexpected popular success and critical acclaim of the documentary film The Linguists, which explored the author and some of the speakers of nearly extinct languages he sees around the world. For another, National Geographic has a well-earned reputation for putting out crappy material , and probably did not want to let any opportunity go to try to build some credibility with those who are genuinely fond of linguistics and geography. And so this enjoyable book has a giant National Geographic logo and the author talks about his career as ways of giving an overrated organization some credibility, which is at least a bit disappointing for those of us who are fond of obscure areas of linguistics . Still, despite the fact that I dislike the commercial context of the book, I will not hold that against the author himself or the interesting subject matter discussed here. The contents of this book read like a memoir of sorts for a linguist who does not consider himself a polyglot despite admitting that he can work with somewhere in the range of a dozen languages, many of them extremely obscure. The author takes a more or less chronological trip through his life in linguistics to its beginnings in his missionary kid background, his discovery of his calling in Tuva, his discussion about the power of the words in describing very extensive local conditions, his discussion of the hotspots of linguistic discovery, how one goes about finding hidden languages like the Koro language of India, the complexity of languages in areas like Papua New Guinea, difficulty of helping to preserve stories (many of them various heathen myths) in other cultures, the beauty of songs in some languages, the process by which only a few isolated people remember dying languages, and the attempts of the author to legitimize his efforts in preserving dying languages. At the base of his interesting experiences and the heartwarming stories of the mostly elderly last speakers whose traumatic early childhood stories are locked in languages that hardly anyone else can understand is a somewhat dubious set of assumptions. And it is these dubious assumptions regarding worldview that keep this book from being as good as it could be. The author's interest in exploring heathen myths about propitiating evil spirits--and at least one of the songs explicitly mentions these spirits as demons --is more than a little bit troubling and casts into doubt the whole viability of the author's enterprise. To be sure, it is tragic to lose the detailed local knowledge that is often embedded in obscure languages, and those aspects of language that help people better understand and deal appropriately with their world are worth preserving either in an obscure language or a more commonly spoken one. In such cases the preservation of knowledge should encourage a language to be more prestigious. In other cases, though, what is being preserved is demon worship and other kinds of practice, and the world would do a lot better without that sort of diversity. The author, because he operates under mistaken premises, ends up unintentionally making the case that the expenditure of scarce money and resources for his linguistic projects all too often only goes to preserve heathen culture that is better off extinct and never again called to mind, rather than to preserve useful and beneficial knowledge for humanity as a whole. To be sure, that was not his intent, though. "Masters of Kurbustug's world, come here, come here! Masters of skies, let us be as equals and friends! The linguist K. David Harrison has been one of the most tireless activists for protecting the world's diversity of languages, some 7,000 or so by his count, but disappearing at a rapid rate through globalization. He wrote an impassioned argument for language preservation in WHEN LANGUAGES DIE, and the recent documentary film THE LINGUISTS about his work has won great praise. Harrison's new book THE LAST SPEAKERS is something of a combination of these two previous accounts written for a very broa The linguist K. David Harrison has been one of the most tireless activists for protecting the world's diversity of languages, some 7,000 or so by his count, but disappearing at a rapid rate through globalization. He wrote an impassioned argument for language preservation in WHEN LANGUAGES DIE, and the recent documentary film THE LINGUISTS about his work has won great praise. Harrison's new book THE LAST SPEAKERS is something of a combination of these two previous accounts written for a very broad audience. On one hand, it's a print account of the fun of doing fieldwork and working with small language communities as in the film, while on the other hand Harrison repeats his scholarly arguments for language diversity in a simpler, more straightforward fashion. Having received a review copy, my opinions are a bit mixed. For the general public, I suppose this can be a quick read (its 250 pages or so go by fast) and an often fun one. Harrison explains pretty clear what it's like to be a linguist, at least a field-oriented one. Linguists, Harrison explains, aren't simply people who "speak a lot of languages", or interpreters or translators. Rather, they are scientists, and their explorations are best carried out not among dusty bookstacks, but with communities that are united around a language. Good fieldwork, Harrison says, means immersing yourself in the daily lives of speakers. Thus we hear some amusing anecdotes about slaughtering a sheep with a nomad family, or hearing the blue guitar music of a young person in Papua New Guinea. This book repeats much of WHEN LANGUAGE DIES, and I was sad to see that it repeats some of the flawed argumentation of that prior volume. Namely, Harrison makes a case for action against language death by holding that traditional languages pass down useful knowledge through the generations simply by being used, and this knowledge is lost through adopting an outside language. He speaks of languages where names for months are tied to the agriculture or hunting cycle, and thus native speakers grow up with a knowledge of the natural world, but some speakers have given up their traditional calendars and use only the Western one. However, ultimately this loss of knowledge isn't necessarily due to language shift, but to other political and social pressures. The same forces which encourage language shift, such as industrialization and urbanization, are those which tend to replace traditional ways of life altogether. When people are living in large blocks of flats in the city, going to work in offices or factories, is the traditional calendar any more meaningful than the new one? Indeed, Harrison notes in this book that a Siberian Turkic population he studies, who herd reindeer and have an abundant lexicon for their way of life, had previously used some other, unknown language and switched to Turkic possibly only a couple of centuries ago. Clearly language shift happened in that context without a loss of information, because these people keep going on herding reindeer efficiently. The problem of loss of information is therefore not language shift in itself. This is an introduction to the work of field linguists who specialize in documenting endangered languages. The author is a professor at Swarthmore College, affiliated with the National Geographic Enduring Voices Project, and director of the Living Tongues Institute. He is often credited with spurring the revival of field work (as opposed to theoretical study) in linguistics. The book is an easy read and contains some amusing and interesting stories about Harrison's travels around the world to fi This is an introduction to the work of field linguists who specialize in documenting endangered languages. The author is a professor at Swarthmore College, affiliated with the National Geographic Enduring Voices Project, and director of the Living Tongues Institute. He is often credited with spurring the revival of field work (as opposed to theoretical study) in linguistics. The book is an easy read and contains some amusing and interesting stories about Harrison's travels around the world to find the last fluent speakers of dying languages. Obviously, the intrepid linguist isn't afraid to rough it a bit, whether that means tangling with surly minor Soviet officials/bullies or slogging through sand for days in the Australian Outback or helping a Mongolian nomadic family herd their yaks. Harrison starts with an overview of his prep for this work and a very brief overview of what constitutes and endangered language. He then tells about his field work in Siberia, Mongolia, Australia, India and part of the US where First Nation languages are dying out. The chapters sometimes read more like independent articles than a cohesive book. Some material is repeated more often than I felt necessary. Harrison obviously feels passionate about his work, and that does come across as preachy from time to time, but I'm not sure that pontifical stance isn't warranted given our society's cavalier attitude about minorities and our miserable track record of respect for non-mainstream cultures. Harrison's argument is that every time a language dies, the knowledge of the speakers is lost, especially knowledge about the natural world. He also argues that language is more than grammatical rules and vocabulary, that its knowledge is based on how the human brain organically shapes concepts and builds information networks, that to lose a language means losing information about how the mind works with concepts. I don't disagree, but neither do I think Harrison argues his point effectively. One of Harrison's complaints is about critics who say about dying languages "Let them die as part of the natural cycle of things" or "if everyone spoke one language, it would be better because we could all communicate." I can't help but imagine that the people who are on the "one language" train aren't all assuming that one language should be American English and how their response would differ if it was suggested the "one language" we should all speak be Spanish or Mandarin Chinese. I'm thinking they would change their minds very quickly. Really should be more like 3.5 stars. The stories are interesting, and I like the message the author is trying to promote. The writing is less than stellar. Somewhat condescending and self-aggrandizing at times. Linguistically, there hints of information, and conflicting traces of various theories, but not much of either. Still I like the message that we should value diversity and promote languages, including the small, nearly extinct, languages. I like India's model of most people learning a local Really should be more like 3.5 stars. I like India's model of most people learning a local language, a national language and an international language. Eventually when I settle down somewhere where I plan to stay for more than a few months I intend to learn which ever language was traditionally spoken there. And teach my kids. But that's just me. I think it'd be cool, but to each their own. This book was an interesting read but not as compelling as I expected it to be. I enjoyed reading about Harrison's travels to the world's "language hotspots," (where there is a high level of language diversity as well as a high threat of language extinction), and about his interactions with speakers of dying languages. However, lot of the other material relied more heavily on the author's opinions rather than facts (in the intro, he does refer to this book as an extended op-ed on the topic of language preservation, so I should have known what I was getting into). Not to say that there are no facts presented in this book, I just thought that the author's (often repeated) stance that with language loss comes loss of integral human knowledge and wisdom would have been stronger had he not been so all over the place. die and how we would all benefit from the knowledge they hold. think the book could use one last revision before being released in September. Overall, it's a great and interesting read. I would recommend it to anyone interested in other cultures or who values learning other people's perspectives. The preachy, vague writing in the first section annoyed me... until the author admitted he's just trying to write an extended op-ed piece on why we should save languages. That explains it. After the author set forth his purpose, I enjoyed the book much more. Especially when he started talking about Siberian folk-tales and vowel harmony. I wanted to read more about the Tuvan heroine Bora, who doesn't have strength or a sense of direction at first, but ends up whooping the butts of tons of warriors The preachy, vague writing in the first section annoyed me... until the author admitted he's just trying to write an extended op-ed piece on why we should save languages. That explains it. After the author set forth his purpose, I enjoyed the book much more. Especially when he started talking about Siberian folk-tales and vowel harmony. I wanted to read more about the Tuvan heroine Bora, who doesn't have strength or a sense of direction at first, but ends up whooping the butts of tons of warriors to save her brother. I think it is fascinating that there are individuals who love and understand linguistics, languages and cultures, and are making it point to study languages, and determine which languages are on the verge of extinction. The fact that these individuals are going out of their way to discover and archive what is left, and to create a database, that may be used in the future for understanding the world we sometimes take for granted. I like how the author pointed out that when a language is lost, so I think it is fascinating that there are individuals who love and understand linguistics, languages and cultures, and are making it point to study languages, and determine which languages are on the verge of extinction. I like how the author pointed out that when a language is lost, so is a culture. Every culture has something to impart, and it's own identity, that can enhance what we know about our selves. This was an enjoyable pop-linguistics book that as others have noted, reads like a half-travelogue. I have some background in linguistics but still found the material relevant and important, particularly as endangered languages and their preservation is important to me. Harrison's descriptions of his time spent with speakers of Siberian languages was the most interesting to me, in terms of explaining how different languages encode different ways of knowing. However, I enjoyed them all and feel t This was an enjoyable pop-linguistics book that as others have noted, reads like a half-travelogue. I have some background in linguistics but still found the material relevant and important, particularly as endangered languages and their preservation is important to me. Harrison's descriptions of his time spent with speakers of Siberian languages was the most interesting to me, in terms of explaining how different languages encode different ways of knowing. However, I enjoyed them all and feel that this book could be valuable to the lay reader, especially the monolingual who doesn't appreciate "different ways of knowing/thinking". It's honestly difficult to articulate, but people who know what I'm talking about will understand, I think. Molt interesant. Parla dels llenguatges en risc de desaparició, explicat desdel punt de vista d'un lingüista que viatja pel món fent treball de camp i registrant-los (sembla un documental de La 2). Potser el to és una mica proselitista i tendeix a idealitzar els estil de vida ancestrals, però després de llegir el llibre no em sembla del tot injustificat. És una visió diferent d'algunes de les conseqüències de la globalització (tot i anar molt més enllà). A mi em sembla que la tasca amb la que s' Molt interesant. Parla dels llenguatges en risc de desaparició, explicat desdel punt de vista d'un lingüista que viatja pel món fent treball de camp i registrant-los (sembla un documental de La 2). Potser el to és una mica proselitista i tendeix a idealitzar els estil de vida ancestrals, però després de llegir el llibre no em sembla del tot injustificat. És una visió diferent d'algunes de les conseqüències de la globalització (tot i anar molt més enllà). A mi em sembla que la tasca amb la que s'enfronta l'autor és impossible, lloable i extremadament romàntica, com totes les causes perdudes. Many thanks to Kate and Tyler for repeatedly telling me to read this. The idea that lies at the core of Harrison's book is that small languages, those that are poorly studied or documented and with dwindling fluent speakers, encode unique and specialized knowledge about human culture and history. Often these languages are spoken by people considered on the bottom of the class structure by the "dominant" culture and correspond to equally endangered biodiverse regions of the world. I can't say muc Many thanks to Kate and Tyler for repeatedly telling me to read this. I found this a completley engrossing read. Harrison's love for languages and the knowledge they embody is contagious. Though I have read Harrison's critics, I would recommend this book to anyone interested in language and culture, even if you don't subscribe completely to the author's theories. Other than the times when Harrison toots his own horn, the book is delightful. It has informed my perspective as an ESL professional, as well. A really enlightening read - living in Australia I am aware of how the local Aboriginal language is rapidly disappearing and I am very interested in finding out if there are any fluent or partially fluent Bunjalung speakers living locally. K David Harrison made me realize how important it is to save the diversity we still have. 885 million people speak Mandarin and only 1 speaks Wichita - sad. One of the greatest if not the greatest calls for action in terms of language endangerment. David Harrison's narratives, descriptions and analysis put on the table in a clear, transparent way the question for cultural endangerment and societal equality. Along with the rest of the materials associated with this National Geographic project, this book is a highlight regarding endangered languages. This is a nice memoir of field linguistics. I found it's rationale for preserving minority languages (1 - every language has an ineffable essence that will be lost if it goes extinct or 2- hidden in an indigenous language might be the knowledge to cure cancer, etc.) a bit preachy, even though I accept the rationale, so I felt he was preaching to a proverbial choir here. This book deals with the author's quest to preserve some of the languages that are quickly disappearing from humankind. He travels from Siberia to Bolivia to Arizona. The author contends that more effort should be expended saving not only the languages but the vast knowledge that accompanies same with the indiginous speakers. Not quite what I expected. It was an eye-opening book, but I could tell the author is used to academic writing. He takes too much time differentiating himself and his work from predecessors. He doesn't do this subtly, either. I found myself wishing that he would let the facts speak for themselves without the preachiness. And the facts WOULD speak for themselves. Harrison gives the non-linguist an inside look at the fieldwork required to document a hidden and endangered language. This book will open your eyes to languages and ethnic groups you never hear about on the news. A wonderful book full of humor and deep philosophical insight into the death of several languages.